Although 96.6% of the power KEC sells is carbon-free, some members would like the option to be 100% carbon-free in their energy purchases. 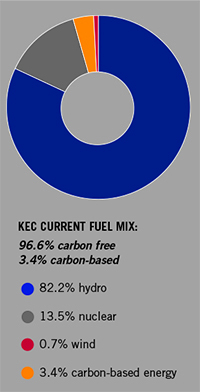 To meet that desire, KEC is now offering two new carbon-free options. In short, these programs allow carbon-conscious members to purchase all or a portion of their power from carbon-free resources. The two options are outlined below. Please note: these programs are voluntary and the members participating in them fully cover the program costs. The remaining 3.4% of your energy consumption will be supplied with clean, local, renewable power. Each month KEC will replace the carbon-based power you would typically consume with carbon-free power. The amount will vary month to month based on your electric use. Purchase renewable power in a block of 13 kWh. Each block is $1 per month. Use this program to reduce your carbon footprint, or go above and beyond and help reduce your friends and neighbors’ carbon footprints by purchasing additional blocks. For example: members using an average of 1,000 kWh per month would need to purchase three blocks to offset their carbon-based power.